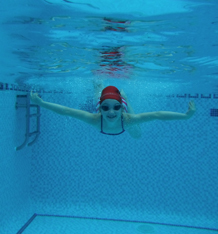 Children will all go through the same learning pattern and stages when learning to swim, there are set skills that need to be learnt in order to be able to swim independently. There is no set ideal age for your child to learn to swim. We would however suggest its best not to leave it too late as they can build up nerves and worries about the water. 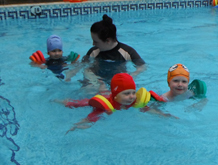 The younger children usually adapt to being in the water a lot quicker and find swimming becomes natural. Swimming lessons are 30 minutes long, 60 minute 1:1 lessons are available at some pools upon request and availability. First Splash provide all armbands, floats, toys and other pool equipment. Water confidence and safety skills, exploring the water, independent movement around the water, games, songs, and play all help with the learning process. 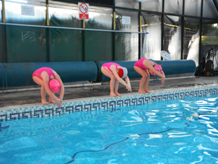 As children progress they will start to make co-ordinated movements which is developed in to learning the basic movements for the 4 swimming strokes. Children are encouraged and helped to start swimming without the use of any swim aids. Once you child is paddling around independently we develop the technique for the 4 swimming strokes and build on stamina. We will introduce other skills such as diving and personal survival. Once your child can swim 100m confidently and is over 8 years old they can move onto the Rookie Lifeguard Programme if they wish. This teaches them about different dangers of water and how to react to save themselves or someone else in difficulty, safely and effectively. Lessons are booked and paid for per term, 12-15 weeks long depending on the school term. Once you have a space you have priority to re-enrol before the end of the current term and if not the spaces are opened up to those waiting. Lessons are 30 minutes long , 1:1 60 minute lessons are available at some pools.